Here at Calendar Lady Promotions we are introducing the brand new £1 trolley coin key ring new for 2019 with 12 sides! We provide the best quality trolley coin key rings and this one will be great, this will be amazing to give out to your loyal customer's are bound to keep them and we are sure that they will always have you in mind! Soon all the supermarkets, gym lockers and games machines will be changing as the new £1 will be used and the old one will no longer be in use so why not beat all your competitors to it and get your logo on these very useful Business Gifts and give them to all your wonderful customer's. 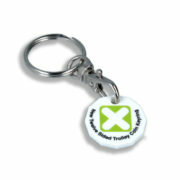 Brand New £1 Trolley Coin Key ring click here. To find out more about our personalised Brand New £1 Trolley Coin Key ring click here and fill in the contact form and we'll get straight back to you.